Thoughts on Today's Verse...Nothing stains quite as sin. It not only leaves a stain in our heart but a residue in our minds. 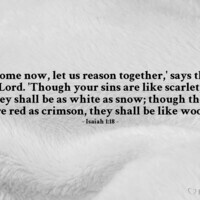 But God's grace is shown in that he doesn't just forgive our sins, he doesn't just forget our sins, he banishes them. They are gone. The stain is removed, the guilt is taken away. We are clean by his grace. My Prayer...O the joy your grace gives me, glorious God! I can never thank you or praise you enough for rerouting the whole direction of my life so that it will end, and begin again, in you and your grace. In Jesus' name I pray. Amen.